Looking for an investment opportunity in Woodstock? Always dreamed of being in the hospitality business somewhere the Catskills? If you're ready to indulge your inner hotelier, here is a unique opportunity. The owners of "The Hippest Little Hotel" in Woodstock NY, after painstakingly doing all the work to build a successful business, have decided to move on to their next project! Enter you. This completely renovated Woodstock Village Victorian, currently operating as a successful hotel is being sold as a turn-key business ready for you to start making money immediately. Designed specifically for Woodstock and music lovers, This unique little Inn sits prominently on Tinker Street which is Woodstock's main street, populated by shops, bars, galleries, restaurants and lots of visitors. It's prominent not only because of its location, but because of the eye-catching exterior color scheme. 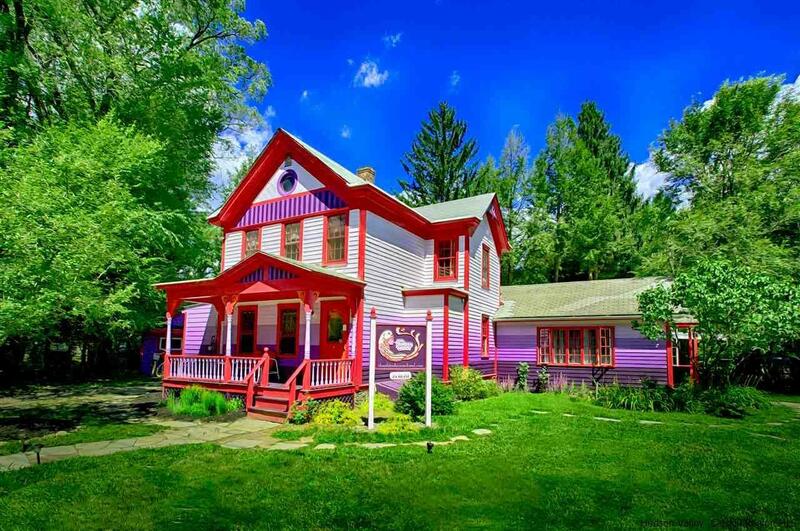 Erin Cadigan, an interior designer and rock poster artist, chose to paint the Victorian Farmhouse with bands of purple symbolizing the spiritual lift you get from listening to music. The stand out paint job shifts the building from quaint to cool, and hints at what awaits inside - Erin's stunning custom wallpaper and fabrics, record players, retro furnishings, rock posters, and vintage photos combine to create a whimsical, comfortable environment. Each of the 4 guest suites are accessible via a private exterior entrance, each with a unique keycode for easy check-ins and also making this a hotel where guests feel comfortable staying for extended periods. One could enjoy this property as a private residence with "tiny house" guest house/rental unit, or operate the whole property legally as a hotel or Air B&B. Easily pay your mortgage and taxes, make a profit, and still have a place to unwind in the country. Close to town and all of its happenings, it's also nice to hop on a bicycle and head to the juice bar, nearby swimming holes or to catch a performance at The Woodstock Playhouse. The first floor of the big house has a 1 bedroom unit with a large living room, fireplace, eat-in kitchen, screened-in porch and 1.5 baths. Additionally on the other side of the building there is a studio unit with built in 4 poster bed, mini kitchen and breakfast bar. Upstairs opens up to a bright and sunny one bedroom suite complete with separate living room/mini kitchen and dining area, French Doors and a balcony overlooking the patio and stream beyond. The charming "Tiny House" cottage across the bluestone courtyard is studio sized with a full kitchen and bath. Additionally there is an office for check-ins and a detached shed which houses bicycles for guests and linens/supplies. Improvements since 2014 include all new wood flooring throughout, new boiler and oil tank for main house, Updated plumbing and electric throughout, mini-splits for A/C and supplemental heat, every bathroom is beautifully redesigned with all new tile and fixtures, new kitchen appliances. New and vintage light fixtures. New paint outside and all decorating finishes, (paint, wallpapers and stencil work) inside. Fire Pit, Patio and screened in porch.